Domini Games, creators of Dark Romance and Mystery Tales, is proud to present another fun-filled Christmas Spirit adventure! Old King Cole was once a merry old soul, but now he rules the Fairytale Kingdom with a greedy iron fist. And now that Mother Goose has gone missing, he’s decided to cancel Christmas! This is the last straw for the King’s poor subjects, and they call on you to help find Mother Goose and restore the kingdom to peace and happiness. 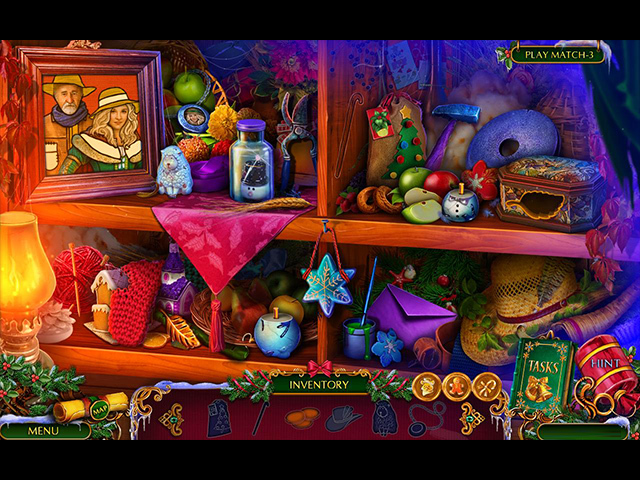 Team up with classic Mother Goose characters like Humpty Dumpty, the Three Blind Mice, and the Crooked Man to stop King Cole’s tyranny and bring Christmas to the Fairytale Kingdom in this charming hidden-object puzzle adventure game! The Christmas Spirit: Mother Goose's Untold Tales is rated 4.7 out of 5 by 6. Rated 5 out of 5 by MrsMoe53 from Spectacular game! Loved everything about this game. The graphics are amazing, the storyline well done and a little familiar to keep you interested, the music is just right. Minigames and HOS galore. Just long enough, and not too short. I am looking for other games by this developer right now! Rated 5 out of 5 by Krob333 from Really great HOG and HOP game I enjoyed the storyline and the characters a lot. The game was right in line with the old nursery rhymes of my past. 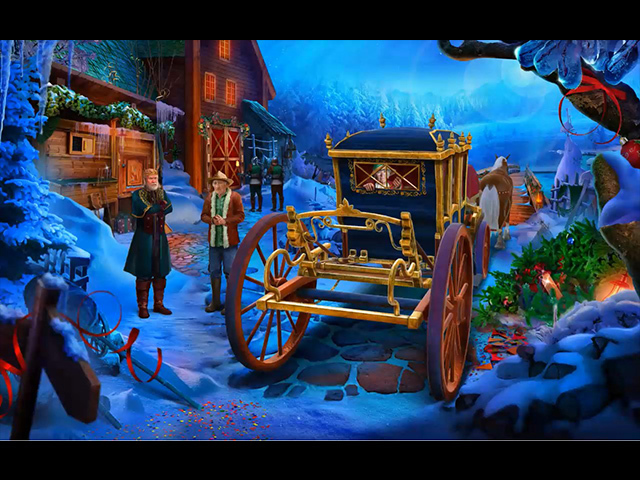 I thoroughly enjoyed the Hidden object scenes. There was variety in how to complete them. Also, if you prefer match 3 you could do that instead. I did the match 3 twice just because it was fun too. Puzzles to solve the objectives were not too difficult to figure out on my own and keep the game moving. That is what I prefer. The graphics were well done with all kinds of detail that was enjoyable to look at. The voice overs were done well and there was only one voice I didn't care for so I skipped the cutscene in that instance. The music was pleasant. It was a refreshing Christmas Spirit game without dark, evil demons lurking around every corner. I don't think it was too short either. Nicely done. Rated 5 out of 5 by Talisbird from Money's worth! Just finished this today, Boxing Day, Tasmania. I needed a nice Christmas fix and this fitted the bill. It has good puzzles that can be played on various levels of difficulty and pleasant HOP'S with an option to play an alternative match 3 game. The graphics were bright, which suits the theme. It is a very jolly game and grandma with the physics degree can play alongside the child. There is something in this concoction for everyone. Rated 5 out of 5 by biscuitsmama from STORYBOOK CHARACTERS COME TO LIFE IN THIS AMAZING CHRISTMAS GAME I love Christmas themed games and Domini has provided an absolutely wonderful and beautiful game with The Christmas Spirit Mother Goose’s Untold Tales. What could be better than to celebrate the season with colorful and terrific graphics as you are surrounded with the younger members of the family all? Mother Goose has gone missing and King Cole has turned into a real bah humbug piece of work as he cancels Christmas. Humpty Dumpty comes into the real world and asks you to please help find Mother Goose since she is the only one who can stop King Cole and save Christmas. 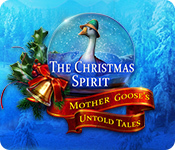 Travel through the Christmas landscape as you meet some of your favorite characters and interact with them as you search for Mother Goose. This is one of the best Christmas games from Domini and, IMHO, is much better than their previous Christmas games. Maybe I am simply a big kid who loves Christmas but this game is so much fun with all there is to do as I search for Mother Goose. There is no need for me to go through all of the spoiler details as others have provided that information. Personally, I would rather play a game and find those special details for myself because discovery is most of the fun. The only thing I will say is that I enjoyed the HOP scenes, even the storybook ones. I was fun to search through the Christmas themed scenes to find the tools I would need to progress in the game. The puzzles although easy (even on the “Hard” setting) still added a lot to my enjoyment. After all since the game can be shared with the family, this is a great game to let the young ones try to solve the puzzles. As a note and it is only a personal comment, if developers can create such beautiful games at Christmas then why do they need all of the evil demons and glowing eyes in most of the games throughout the year? I think it is time that the devs stretch themselves to come up with storylines that don’t rely on past games and get rid of smoky figures with glowing red eyes. If you love Christmas themed games, then I think you will enjoy this one. 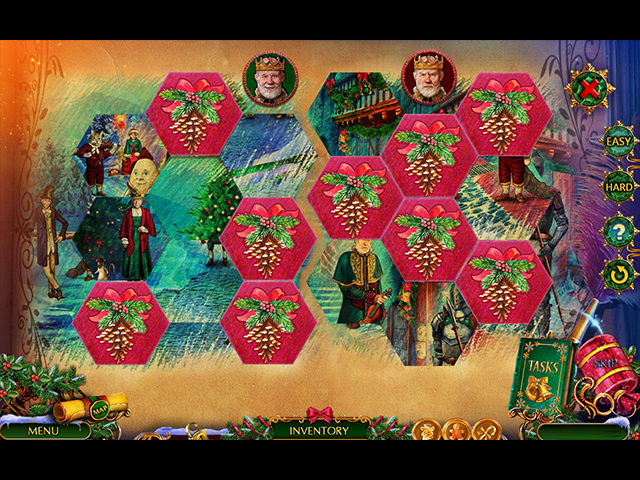 It is a game that can be shared with the family as you enjoy the season together. As always, please try the demo to see if this is a game you will enjoy as well. Happy gaming! Rated 4 out of 5 by beltie from Nice Christmas Game Enjoyed it Graphics: for the most part are good. Some backgrounds are very dark though at the top and sides of the screens. Had to adjust my monitor so I could actually see items we were supposed to find. Some items could have been a tad bit larger as well. Tired eyes need "easy-on-the-eyes" graphics 95% of mini-games were logical A bit of back and forth, but not excessive. Interactive Map available as well. For those who purchased the CE, you can also set the Options to show collectibles on the Map Storyline: Happy ending. Nothing dark here. Just some greed. Suitable for any level Player. Reasonable length. Personally, I am not a fan of the endless HO game that feels like it goes on forever and then bombards the player with a ton of HO scenes one after the other at the end. This game did NOT do that. Thank you! Felt the different Mother Goose characters added flavor to the Game. Music: muted, so cannot comment. Enjoyed this one and would recommend it.